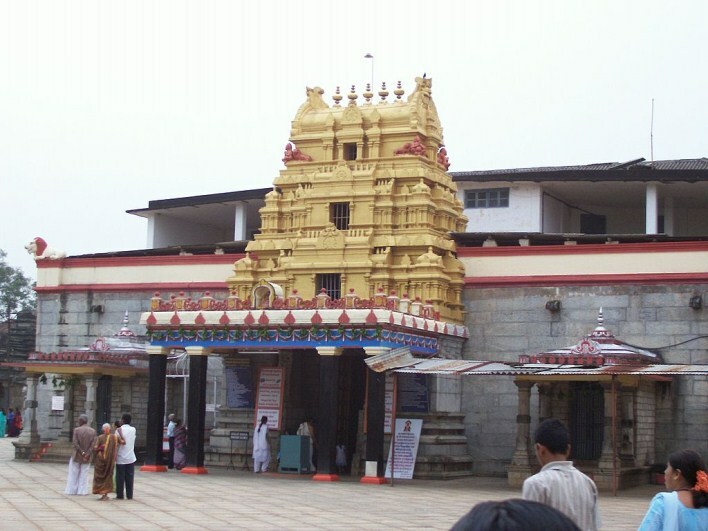 Shringeri Sharadamba Temple is located in Shringeri town, in the Chikmagalur district of Karnataka. The Sharadamba temple in Shringeri was established by Sri Shankaracharya when he established the Sharada Peetham Matha here. It is a beautiful temple, set in the Malnad region. Shringeri is located on the banks of the river Tunga. It is a famous pilgrimage center, and very important for the followers of Shankaracharya. Shringeri Sharada Peetham and Shringeri Sharadamba temple were established by Adi Shankaracharya. There is a beautiful traditional account of how he came to choose this spot for a Matha. As Devi Saraswathi had decided to reside here, he built a temple here and installed a sandalwood idol of her as Sharada Devi, in a standing posture. It is believed that during the Muslim invasion under Malik Kafur, the original idol was destroyed. During the Vijayanagara period, a gold statue of Sharadamba in a seated posture was installed here. Recently, a Gopuram was added to this temple. Navaratri or Dusshera celebrations are a grand occasion here. The Goddess is taken out in procession, and thousands attend the festivities. The nearest airport is present in Mangalore. Shimoga and Kadur are the nearest railway stations. Bus services are available from most places in Karnataka to Shringeri.